Bowes-Lyon Partnership’s favourite London Concierge, Bon Vivant, have come up with the top 10 ‘must visit’ London beer gardens and terraces. So whilst the weather is this good, be sure to check them out – they’re all spot on as a Summer date venue! With a beautiful riverside setting and a large decked terrace to embrace the British summer, The Gun is one of the best dining experience in the Docklands offering a great British pub menu. In the summer, be sure to visit A Grelha at The Gun, an al fresco Portuguese BBQ of fresh fish and meats on the decked terrace. 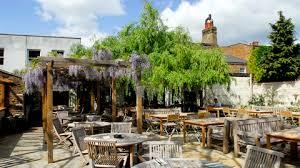 The Albion is a traditional English country pub in the heart of London, with the main attraction being its garden. The French windows in the restaurant area open onto a terrace of over 450 sq metres, which can seat over 120 people for dining and drinking surrounded by herb beds, fruit trees and an original Georgian walled garden. In the summer months, the outdoor barbeque is a real draw, as well as the whole roast suckling pig for 10 to share. Despite the ample dining space, the bar area is on the small side, but there is respite in the form of a back garden, which is an ideal spot for long summer lunches. Housed on the banks of the Thames by Wandsworth Bridge since 1786, with a quiet and relaxing front bar, a large conservatory and an excellent garden overlooking Wandsworth Bridge, The Ship is a lively and sociable spot for summer drinking. Covered with beautiful wooden floors and panels, with its labyrinth of connected rooms, the Windsor Castle is an authentic, historic British pub. The relaxed and friendly feel extends to the rear garden with its ivy-clad walls, which is always bustling in the summer. The Avalon has 3 impressive outdoor spaces, including a front terrace, a side garden and a beautifully landscaped rear garden, which features an al fresco Mediterranean menu complete with charcoal barbecue and rotisserie. With plenty of space for diners and drinkers, The Avalon is set to be the pub of choice for South Londoners. Situated on the Hampstead / Belsize Park border, a short stroll from Hampstead Heath, The Stag’s main selling point is its spacious garden, which is ideal for the summer and also when it becomes a little cooler, as some of the cabanas come with their own heaters. The stag is known for its decent ales and classic British menu, which also features a barbeque in the garden in the summer. While the upstairs dining room can feel a little cold, downstairs it is bustling and welcoming with excellent quality cooking, resulting in The Drapers Arms being awarded a Bib Gourmand in the 2010 Michelin Guide. The terrace at the back of the pub is a much coveted spot when the sun shines. The Crabtree is a newly refurbished Victorian pub set on the river between Hammersmith and Putney, which has stunning views of the Thames. Although they serve classic gastropub food, the main attraction is the lovely and extensive beer garden, right on the edge of the Thames. Nestled on a leafy street, just moments from Upper Street, The House is a pub with higher ambitions in the kitchen. Along with a cosy and intimate interior, there’s a fairly spacious front terrace from which to enjoy a beer in the sun. Bowes-Lyon Partnership is one of London’s leading introduction companies. We offer a first-class, discreet service that’s second to none and we give the serious business of meeting someone new a very personal touch. Clients are paired via our expertise in understanding and interpreting the needs of others, resulting in compatible, lasting matches. The original article was published here. ‹ Your Best Chance of Securing An Elusive London 2012 Olympic Ticket!